Nosrat's own formal culinary education came at Chez Panisse, the legendary restaurant in Berkeley, Calif., founded by Alice Waters. She first went there as a diner, then asked for a job and got one, working her way up. And it was while cooking at Chez Panisse that Nosrat had the revelation that eventually led to this cookbook — that salt, fat, acid and heat are the fundamental elements to good food. "The elements and the tenets of professional cooking don't always get translated to the home cook," she tells NPR's Rachel Martin. "Recipes don't encourage you to use your own senses and use your own judgement. 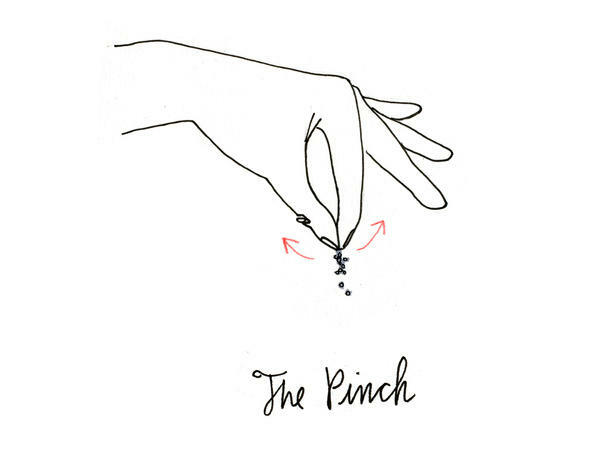 And salt, fat, acid and heat can be your compass when you maybe don't have other tools." Nosrat frees her readers to use their own senses instead of measuring cups. She says we should salt things until they taste like the sea — which is a beautiful image, but also sounds like an awful lot of salt. "Just use more than you're comfortable with, I think is a good rule for most people," she says. You know, especially when you're boiling things in salted water, the idea is that most foods don't spend much time in that water. So the idea is to make it salty enough that the food can absorb enough salt and become seasoned from within. A lot of times you end up using less salt, total, if you get the salt right from within, because then the thing isn't over seasoned on the outside and bland in the center." Nosrat's conversation with Martin is excerpted below. The transcript has been edited for clarity. 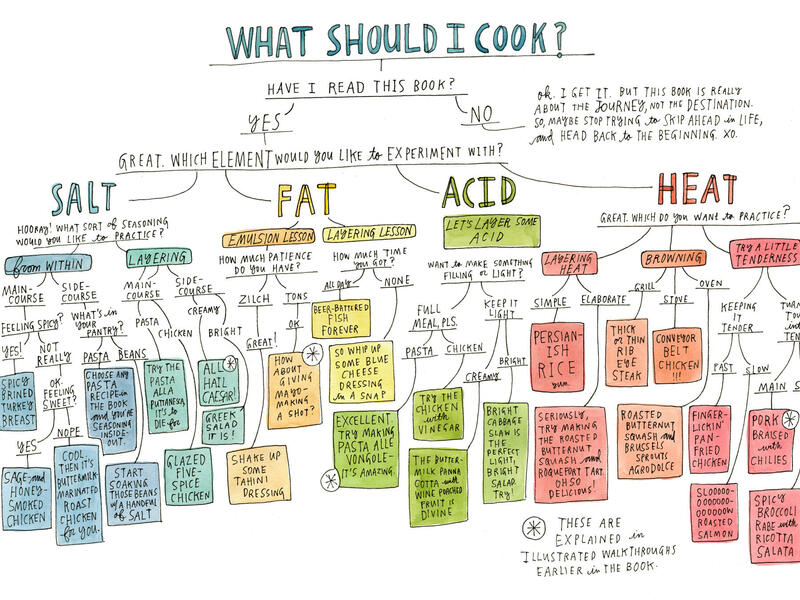 RACHEL MARTIN: So, let's get to fat, which is the next central element to cooking. This is something that people are afraid of. Even though we understand the difference between good and bad fat, fat still gets a bad rap in cooking. To me, it's a tragedy because I think fat has this remarkable capability to offer us all these different and very interesting and delicious and mouth-watering textures in our food. And it's just about learning how to get those textures out of the fat that you're already using. 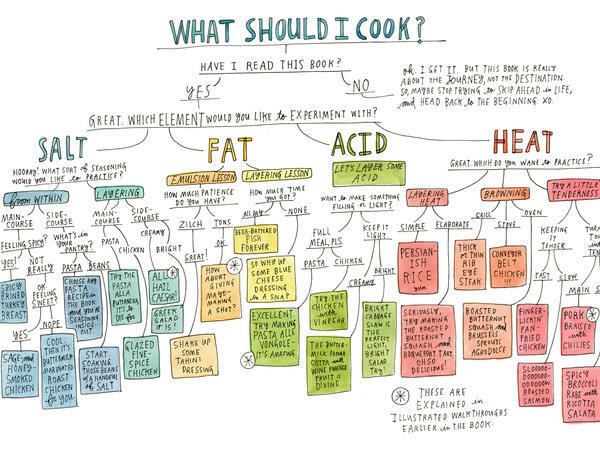 When you talk about acid in our food, what do you mean? For me, it is all about getting that nice, tangy balance in a bite, in a meal or in a dish. And you can get that through citrus and vinegar and wine, which are maybe the three most obvious and well-known sources of acid. But then there's acid in so many other things. Almost every condiment we add to our food is acidic, which is why when you get a bean and cheese burrito, you're always hungry for salsa and sour cream and guacamole to put on there, because those things will just perk it up and add flavor. The last element we're going to talk about is heat. 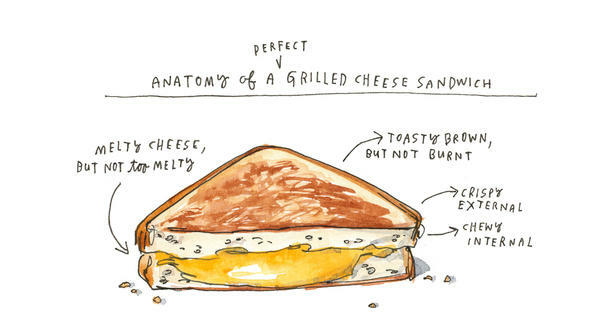 You say a grilled cheese sandwich can actually be a great guide on heat. What do you mean by that? I was trying to think of something that everyone has made. And the thing about heat, I realized, is that when you're cooking a food, what it sort of boils down to — no matter what the food is — is to get your desired result on the outside and on the inside. And so your dream is to get that perfect grilled cheese, where the outside is crisp and brown and buttery and delicious, and the inside is melty and perfect. I flipped through this book. There are some fantastic illustrations in there by Wendy McNaughton. 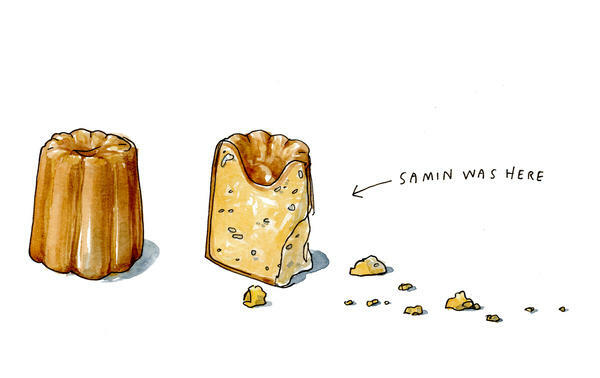 But there aren't any of the big, glossy photos traditionally found in cookbooks. This book and this message is about teaching you to be loose in the kitchen. And I didn't want you to feel bound to my one image of a perfect dish in a perfect moment and feel like that was what you had to make. So I didn't want you to feel like you had to live up to my version of perfection. Lastly, I want to ask you about the dedication in the book. You thank Alice Waters, owner of Chez Panisse, for giving you the kitchen, and your mom for giving you the world. What does your mom make of your career now? It's been an interesting experience being the child of immigrants and explaining this non-conventional path. But, I think once she could go to the store and buy a magazine that I'd written for or, now, this book — I think that she gets that I've figured something out. Do you cook for her? She doesn't like my kind of cooking. So when Sunday night dinner comes around, she does the cooking? Like I said, she's a good cook.